This was the first time I've ordered fish online. Jay was extremely helpful and did everything he could do to get me the fish I wanted. He even pointed out which ones would co-exist with each other and which ones wouldnt. The fish got here on time and were all alive and healthy. I ordered 2.5" . . . .
Photo by Ben Wright one of my customers. This photo was taken shortly after the fish arrived and was acclimated to his tank. The photo is of the older version of this fish. The new more yellow version is even better when it reaches full color. These fish are primarily available through my special order lists. Occasionally they are brought in to stock in 3" or larger males as well. Be sure to sign up for the newsletter in your account (Name, Address, Phone number for shipping purposes) to know when these fish are available. Single males mix with other Haplochromis types in a show tank. 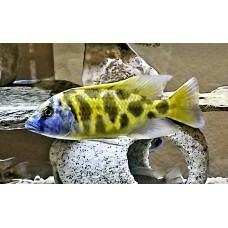 Iffy in 2.5-3.5" size with Peacocks due to aggression level. However, less aggressive when females are not present and Peacocks are 3.5" or larger. Smaller males are less aggressive. Males between 2.5 and 3.5" tend to be aggressive. Males 4" and larger tend to be Mildly aggressive. This strain seems to be less aggressive than some other strains. 3.5 to 4" and larger males seem to mix well with many other African Cichlids including Peacock Cichlids. Best kept in single male tanks with Lake Malawi Haplochromines. Many customers have been very pleased with the color this fish shows in their tanks.